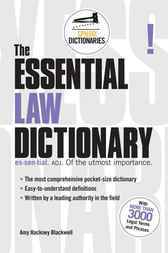 The Essential Law Dictionary is an essential up-to-date legal reference, containing over 3,000 entries explaining legal language that can often be hard to understand, even for lawyers. This book focuses on defining the terms that people today are most likely to encounter when dealing with the law. The definitions are clear, concise, and easy-to-understand. Whether you are a lawyer, a law student, or a layperson, this handy reference will help you understand the precise meaning of any legal term.